In the second feature of our Spotlight Series, we asked Curve who would succeed in aggregation and what plans the provider has for its solution. First, a bit of background… this digital wallet enables users to add all their cards to its app, replacing them with one card. For each transaction, Curve’s technology chooses the best deal for the customer. During the Beta test, the provider had 100,000+ sign-ups that spent more than £100m. At its launch in January, over 50,000 people were on the waiting list. We asked the Head of Growth at Curve, Charlie Taylor, about the evolution of aggregation, Curve’s future plans, and how Open Banking will shape the next generation of financial tools. We are seeing both FinTechs and banks venturing into account aggregation. Which players do you think will succeed in the space and why? Account aggregation in itself has little value and even with new aggregator apps or features inside banking apps, it actually takes effort by a customer to aggregate everything – such as giving time to connect each account, or overcoming anxieties around account security and data privacy. Aggregation is helpful only because the fragmented and disconnected set of credit, current and savings accounts that many people have make it difficult to achieve things people actually want, like making better spending decisions or setting better financial goals or feeling more confident financially about the future. So, we’re competing to be best at enabling customers to achieve things they want, with the least hassle in getting those things – whether they’re practical or mental barriers. 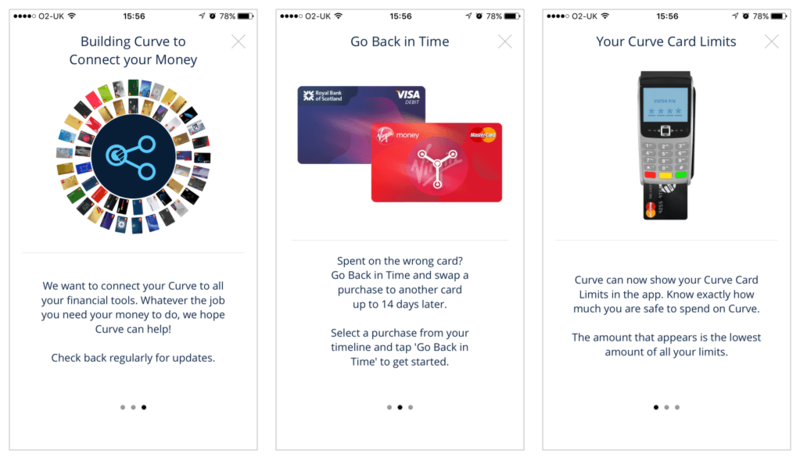 Last year, Curve added a ‘Go Back in Time’ feature, which allows users to change the card that they paid with up to 14 days after a transaction was made, and card limit feature, which shows how much the user has left to spend. Where aggregation is necessary, the winners in that competition will be those who (i) deliver immediate value simply for getting started (even with just one account), (ii) use other features to make aggregating accounts worth the initial effort, and (iii) use aggregation in combination with data insights and integrated propositions (from “a savings account” to a marketplace) to genuinely make people’s lives simpler and better. With so many new entrants still to come and so much development still to happen, it’s impossible to predict exactly who’s going to win. But I’m confident that they’ll have some way of achieving everyday engagement beyond simple notifications of activity (which get boring), they’ll have a combination of payments and rewards integrated with the account aggregation, and they’ll have a flourishing set of integrated propositions that make it really easy to get value out of sharing so much data. Currently, you allow your customers to pool any of their card spending from selected retailers into Curve Rewards, your instant loyalty/rewards scheme. How do you see this evolving? What other types of partnerships are you considering? We’ve actually launched a new version of rewards that allows the user to choose where they earn. This is a first step in the direction of more personalisation. Beyond that, we want to enable partners to more easily set themselves up as a Curve rewards partner either for customer acquisition or for longer term loyalty, and we want to give users control over how their data is used so that they can, if they choose, share data in order to earn value back from it – for example in the form of more targeted promotional offers. We’re also planning ways to help users cut even more cards – loyalty cards – from their wallets, as it’s something a lot of users say they love about Curve regarding payment cards. Less plastic, simpler spending, more points. How do you expect your offer to develop for business / SME users? A couple of things people can expect from Curve are simpler ways to enable business spending, and simpler ways to submit expenses for reporting and reimbursement. We can’t say much more at this point! Many commentators are saying that the account aggregation we’re seeing now is just the start of what Open Banking can do. What do you think is the future? Think about today’s health tracking aggregators like MyFitnessPal. You wake up with insight into how you slept, how your overall sleep health is, how it affects your everyday mood and performance, and how to improve your sleep habits. Through the day, you get insights into your level of activity and what it means for your overall energy balance, with insight into how well you’re doing and tips on what to change. You’re part of a community of people with whom you can share experiences and learnings. You feel more connected to others, more informed about your health, and better able to take care of yourself. The future of our relationship with money has a similar bottom line – it’s less about accounts here and accounts there, trying to keep on top of things but finding it effortful, frustrating and anxiety-inducing; it’s more about feeling informed, more in control, more confident about where you’re going financially and better able to make smart decisions because the hassle in doing all the basic personal finance admin has been replaced by smarter, personalised software (such as connected apps and automated recommendations). Something similar is happening with smart homes, using things like Alexa or Google Home. Making connections between different parts of the house (lights, heating, entertainment, etc.) and having them make smart recommendations or decisions means you end up with a more efficient home that’s nicer to live in. Ultimately, we should never think about “aggregation” – we should just be thinking about where do I stand financially, where am I going, what are the best options for me, and so on, and the answers should be immediate and easy to act on. Mapa tracks Curve and 18 other aggregation providers every quarter in our Aggregation Monitor. For more information, download a free sample or get in contact with us today.